In looking for trans authors to interview for this series, there was one demographic that I found shockingly difficult to include: black trans women. Living at the intersection of anti-black racism, transphobia, and misogyny, black trans women face high levels of unemployment and poverty, discrimination, and violence. These women have also been leaders of trans activism since the days of Marsha P. Johnson, but their lives and struggles have historically been overlooked. I wanted to include the voice of at least one black trans woman in my interviews, but I couldn’t find a single mainstream novel by someone matching that description. On a blog devoted to intellectual freedom and anti-censorship, let’s take a moment to reflect on the fact that entire class of voices have been excluded from this form of expression. 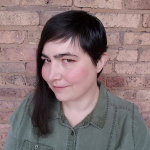 I decided it was time to go off-book (so to speak), and ask for an interview with writer, poet, musician, and performance artist Lady Dane Figueroa Edidi. 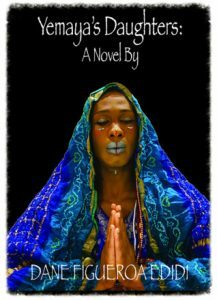 I purchased a copy of Edidi’s self-published novel Yemaya’s Daughters, which quickly captivated me. Although it lacks the polish of mainstream publication, it is a beautiful, sensual work. 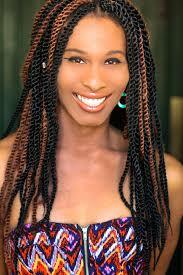 The main character, Inanna, is a trans woman born into a divine sisterhood set in African Eden. Edidi’s prose is as otherworldly as the narrator herself; there is less of narration in it than there is of spells, songs, dreams, and magic. Like lines of poetry, it doesn’t always make logical sense but taps into some deep-seated emotional or spiritual rationale. What inspired the story of Inanna and her sisters? When I was young my aunt Liz really encouraged me to study history on my own, to read books about the world before colonization. As I grew and learned more I found so many examples of what we call TGNC [i.e., trans and gender-nonconforming] people being honored and loved in precolonized cultures around the world. And I began to ask if we were loved and in honored then what happened. The answer was colonization. I wanted to write a book about how colonization ruined the world and that transphobia and homophobia were forced on to people of color by colonization. At first I was gonna do an Academic research book but then I thought how ancestors taught life lessons, and I thought about Jesus: they would tell stories to explain things. So, I asked what would happen if a Trans woman existed in a place untouched by colonization. What would happen if she came to this world today. And because I am a sister who is a part of several Sisterhoods, I decided to make it about her and her sisters. Did you feel that you faced a choice between self-publishing the story you wanted to tell, and compromising your story to appeal to a publishing house? Absolutely. I knew this work had to be about more than the cis [i.e., not trans] and white gaze. No shade to cis led publishing houses, but I have found many often have a desire to force trans people into a box appealing first to the cis and white gaze. I wanted to make a book that was written because it is what ancestors wished to have manifest. More white trans authors are getting published than ever before, but trans writers of color are still excluded from the publishing industry. What are some of the barriers to publication that you face as a trans woman of color? White Supremacy. It is the greatest threat to everything. Cis led publishing houses often want Trans Women of Color particularly Black Trans Women to do autobiographies. I am too young to do one. Hahhahaha but seriously I am a writer who happens to love fiction, and scifi, and graphic novels and poetry and I am not invested in writing to only teach cis people to be better people, or to invest in a trauma porny type engagement with readers, or to let cis people off the hook for the ways they invest and profit off of the oppression of Trans people. If a publishing house wants to publish my work, they are going to have to deal with an artist who fights to end white supremacy and has no investment is pretending anything else. The works that were my greatest inspirations were fiction, plays, poetry, novellas. I wanted to write and am writing those. Yemaya’s Daughters is not just a story itself, but a collection of many stories told by many people. What role has storytelling played in your life? How do you see the storyteller’s role in contemporary society? Stories are everything. I grew up hearing stories about my family. Those were some of my happiest moments hearing how my mother and her siblings were rowdy back in the day, hearing how noble my grandpa was, how loving my grandmother was and the stories of history. My Aunt Liz’s ways of fighting for civil rights and touring with her husband singing jazz up and down the east coast and how Baltimore before it was abandoned by the Government was a place filled with a different type of vibrancy. People are telling or retelling stories at every moment. Storytelling is critical to the survival of People of Color. It is a lifeline to traditions, and ways of life that speak to a time before colonization. Stories can heal, teach, release, and hold accountable. Stories can also trap, and deceive. The current U.S. Administration and GOP Congress use stories to embolden hate, lie to their base and oppress us all. The True story of the U.S. is not sunshine and roses, it is bloody, genocidal, whittled with oppression and violence. If we truly want to heal this country, if we want to heal the world, we must tell the true story so accountability can take place and healing can truly begin. What audience do you imagine for this book, and how did that affect your writing? I imagine everyone to be the audience. While I write books absent of the cis gaze, or perhaps in spite of the cis gaze, I do think everyone can get something from my books whether they are Trans or cis. I am ultimately telling stories. And specifically wrote this story from Inanna’s perspective so that when people misgender her it’s jarring to the reader, even a cis reader. What other trans authors would you recommend checking out? Do you have any advice for aspiring trans writers? Surrender to the Muse, write. And also know that what you have to say is deeply important and needed. There is room for all sorts of stories and the world is waiting for them all. Write. Oh, and also, never forget pencils have erasers.